Astronomers have discovered a black hole that is consuming gas from a nearby star 10 times faster than previously thought possible. The black hole—known as P13—lies on the outskirts of the galaxy NGC7793 about 12 million light years from Earth, and according to the International Center for Radio Astronomy Research, it is ingesting a weight equivalent to 100 billion billion hot dogs every minute (yeah, that’s kind of weird way to measure things). The discovery was published this week in the journal Nature. When Dr Soria and his colleagues from the University of Strasbourg measured the mass of P13 they found it was actually on the small side, despite being at least a million times brighter than the Sun. It was only then that they realised just how much material it was consuming. “There’s not really a strict limit like we thought, black holes can actually consume more gas and produce more light,” Dr Soria said. P13 rotates around a supergiant ‘donor’ star 20 times heavier than our own Sun, and scientists saw that one side of the donor star was always brighter than the other because it was illuminated by X-rays coming from near the black hole (so the star appeared brighter or fainter as it went around P13). 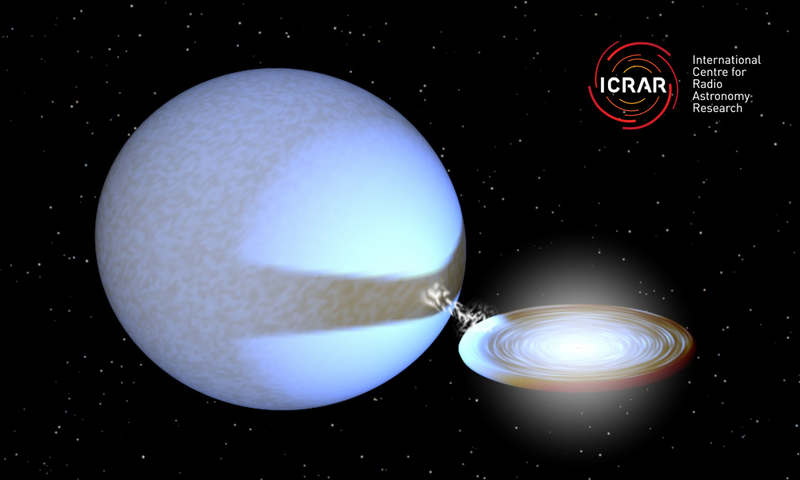 This article comes from the International Center for Radio Astronomy Research.